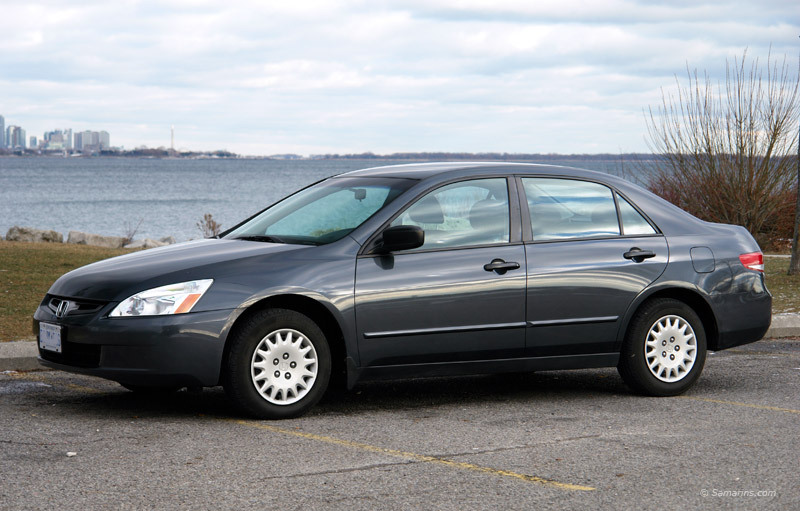 The 2003-2007 Accord is a roomy well-designed mid-size car with good handling and firm ride. The Accord scored well in government crash tests. The 4-cylinder Honda Accord has one of the best fuel economy ratings in its class. The Accord has front-wheel drive and comes as a four-door sedan or two-door coupe, with a 4-cylinder of V6 engine. The interior is nicely finished. Front seats are very comfortable and supportive even on long trips. The high-tech dashboard design with sharp looking instruments stands out from the crowd. Rear seat space is generous. The trunk is large and the rear seatbacks fold down to accommodate longer items. For the most part it's a very reliable car, but there are a few weak spots. Read more below. 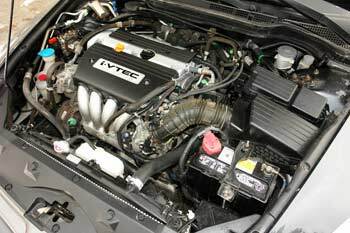 Honda Accord 2.4L 4-cylinder i-VTEC engine. Powertrain: Two engines were offered: the economical 166-hp 2.4L 4-cylinder K24 and smooth and powerful 244-hp 3.0L J30 V6. Transmission choices included a 5-speed automatic or 5-speed manual. A 6-speed manual transmission was available in late EX V6 models. The Accord's 2.4L 4-cylinder DOHC engine with i-VTEC is one of the best in its class; it is a strong, yet very economical low-maintenance workhorse. Fuel Economy: The 4-cylinder Accord is ranked near the top of the family sedan category in terms of fuel economy. The 2007 4-cylinder automatic Accord is rated at 21/31 mpg (11.2/7.6 L/100 km) city/highway. 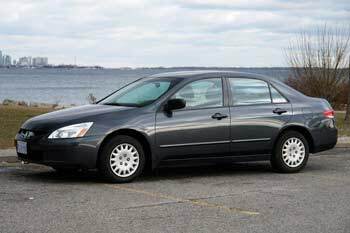 The 2007 4-cylinder automatic Accord can drive for 431 miles (693km) on one 17.1-gallon (64.7L) tank of gas, based on 80% highway, 20% city driving. 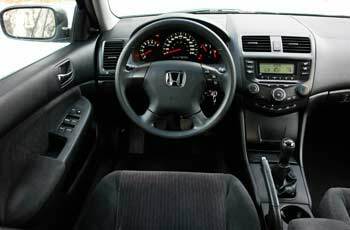 The 2007 V6 Accord with an automatic transmission is rated at 18/26 mpg (13.1/9.0 L/100 km) city/highway. Handling and ride: On the road, the Accord handles very well with good road feel. The steering is responsive and precise. The ride is firm and not very quiet. The wind and road noise are noticeable at higher speeds. The 4-cylinder engine is strong enough for daily driving, while the V6 is one of the most powerful in its class. Timing belt or chain: The 4-cylinder engine doesn't have a timing belt; a maintenance-free silent timing chain is used instead. 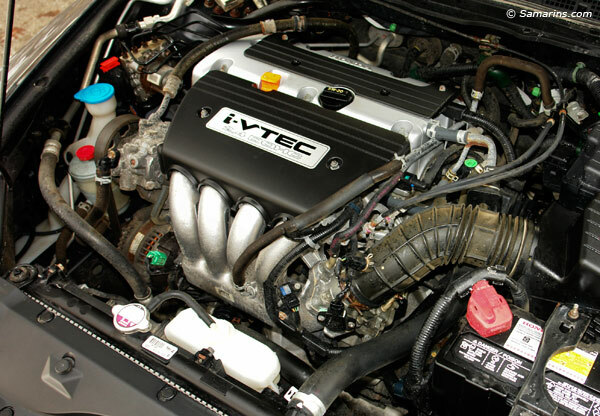 The 3.0L, 24-valve SOHC V6 VTEC has a timing belt that needs to be replaced at recommended intervals. Pros: Fuel economy in 4-cylinder models, V6 power, excellent handling, responsive steering, safety ratings, rich-looking interior, sharp instrument panel, easy to maintain. Cons: Road and wind noise, paint chips easily, automatic transmission problems in early models. Overall: This generation Honda Accord is one of the most reliable mid-size cars. We recommend a 4-cylinder Accord; it's easier to maintain, good on gas and the automatic transmission is less likely to have troubles. The Honda K24 2.4L engine is one of the best on the market. 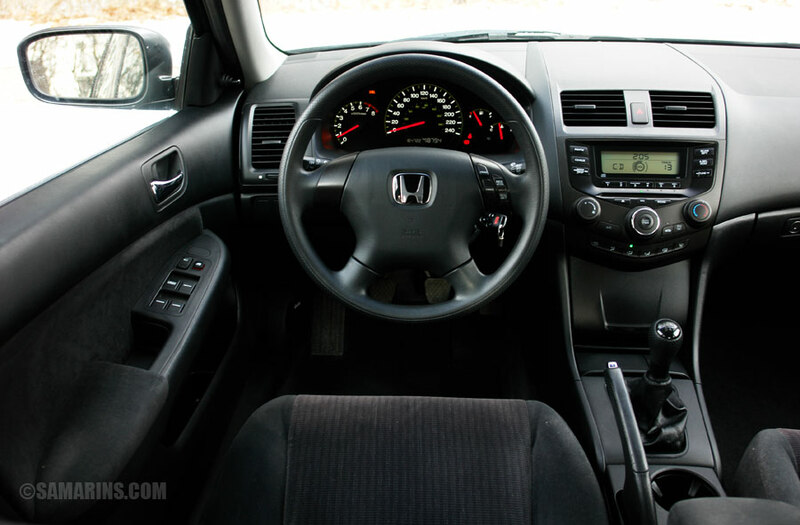 We have taken the 4-cylinder manual Accord on many very long road trips and it performed flawlessly. Problems: There are numerous complaints about the automatic transmission, mostly for 2003 and 2004 V6 models. A starter motor can go at higher mileage. The cost to replace a starter is between $300 and $550. Rear O2 sensor failures are common ($250-$430 to replace). Oil consumption is mentioned often too. The audio & HVAC display not working is another common issue in early models. The solution is to replace an audio unit, although there are a couple of Youtube videos describing the repair of the circuit board inside the audio system. What to look for when buying a used Honda Accord: Don't buy a car if the "Check Engine" light is on before you know what the problem is; once we have been contacted by a person who bought a Honda Accord over eBay with the "Check Engine" light on. After further diagnostic, It turned out that the engine needed to be rebuilt due to lack of compression in one of the cylinders. During a test-drive, watch out for anything irregular with the automatic transmission; it is a weak spot. If there is a "clunk" when shifting into Reverse, avoid the car. When inspecting a car, check the engine oil level; low oil level could indicate possible oil consumption. Watch out for a noisy power steering pump. Make sure to test the CD changer. Check if the stereo and the heater control lights are working; if not, the repair could be expensive. Read more What to look for when buying a used car. This post has a well-done summary of common issues: 7th Gen FAQ. Before buying a car, have it inspected by an independent mechanic. Maintenance: The Accord's paint chips easily; repair the chips and scratches in the paint before they get corroded. In the Rust Belt, it's good idea to rust proof the underneath of the vehicle to protect important components. Wash your car regularly and wax it at least once a year to seal the paint finish. Check the engine oil level regularly, especially if the engine uses oil between the oil changes. When checking engine oil, If it appears too dirty on the dipstick, have the oil change done. Checking the oil level is easy. Read our maintenance checklist with illustrations. With a V6 engine, be easier on your transmission. Change transmission fluid in recommended intervals, using original Honda transmission fluid. For any repairs, use original Honda parts. Once a year, have your car inspected in a garage to keep it safe. If you need an owner's manual, here is the link: Where to find an owner's manual. Honda Accord Safety ratings: Anti-lock brakes were standard; traction control was standard on V6 models. In the NHTSA frontal crash tests, the 2003-2007 Honda Accord received five stars for both the driver and the front passenger. In the frontal offset crash tests performed by the Insurance Institute for Highway Safety (IIHS), the 2003-2007 Honda Accord received "Good" overall rating.